If Joseph “JoJo” Diaz had as much punching power as he has personality, he’d be the complete package. Alas, fight fans had to satisfy themselves with another fast-paced, one-sided distance fight for Diaz in the chief undercard bout supporting the Canelo Alvarez-Gennady Golovkin showdown — seemingly the default outcome for a talented 2012 U.S. Olympian who hasn’t been able to visibly hurt anybody lately, no matter how much torque he puts into his digging bodyshots and southpaw right hooks. On this occasion, the guy on the receiving end of those more-nifty-than-nasty punches was late substitute Rafael “Big Bang” Rivera, who, despite his monicker, wasn’t such a big banger himself. But he was undefeated, brave, game, and in great shape for a man who took the fight on four days’ notice (he was training for another fight at the time). For 12 rounds, both fighters’ best shots bounced off the other man, but it was JoJo beating Rivera to the punch and accumulating points throughout. 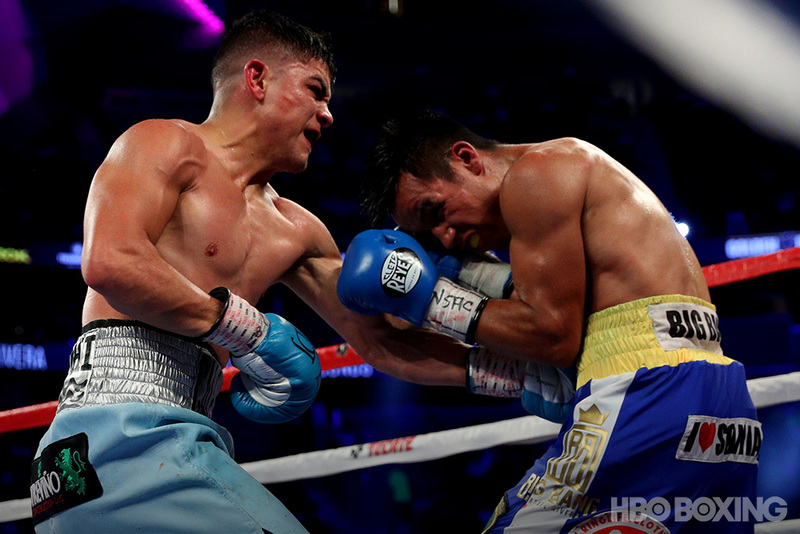 The 24-year-old Diaz took a few rounds to fully find his rhythm, but by the fourth, he was landing his best shots flush. An arsenal packed with left crosses and right hooks was expanded in the fifth to include some excellent left uppercuts, and by the ninth, it was turning into the kind of fight in which a case could be made to stop it. But the 26-year-old Rivera (25-1-2, 16 KOs) never stopped trying, never stopped throwing. Diaz (25-0, 13 KOs) was so comfortable by Round 10 that he was dropping his hands, but Rivera hung in there until the final bell to hear scores of 119-109 (twice) and 120-108 go against him. 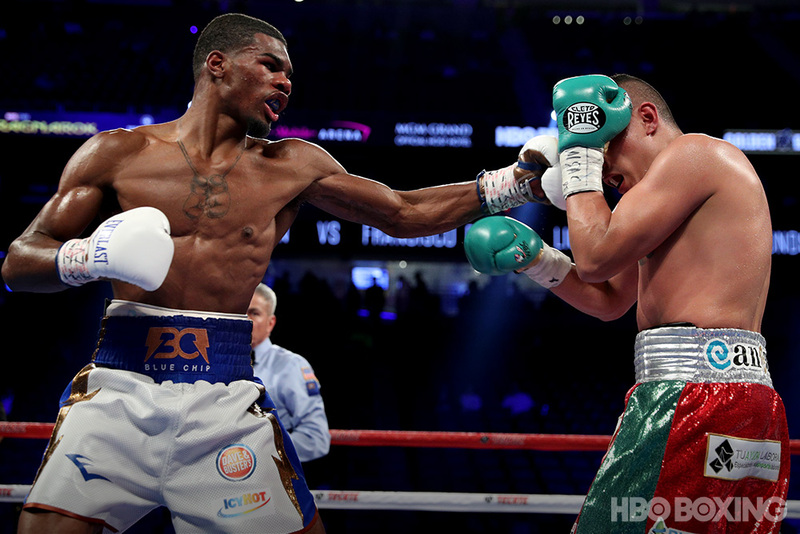 Diaz called out 2008 U.S. Olympian Gary Russell Jr. when he was on the HBO Boxing Podcast on Thursday, and with this win, he becomes Russell’s mandatory challenger. That would be a serious test of just how far Diaz can go with his combination of exceptional skill and ordinary power. There are pros and cons to bearing the De La Hoya name as a boxer. It opens up opportunities, but it also carries unfair expectations. For Diego De La Hoya, an opportunity on the Canelo-GGG undercard became a vehicle to elevate expectations even higher, as the 23-year-old looked like one of the best prospects in the 122-pound division in dominating a step-up fight with unbeaten former bantamweight beltholder Randy Caballero. On the heels of a brief shoving match at the weigh-in that Uncle Oscar had to break up, there was no such drama on fight night. Judge Robert Hoyle gave De La Hoya (20-0, 9 KOs) all 10 rounds, while Eric Cheek and Patricia Morse Jarman both awarded him eight of the 10. It looked like a tough fight to predict on paper, but within a round or two, it was clear De La Hoya was too sharp for Caballero (24-1, 14 KOs). Combinations rained on Caballero, then the fleet-footed Mexican De La Hoya zipped away before anything could come back at him. 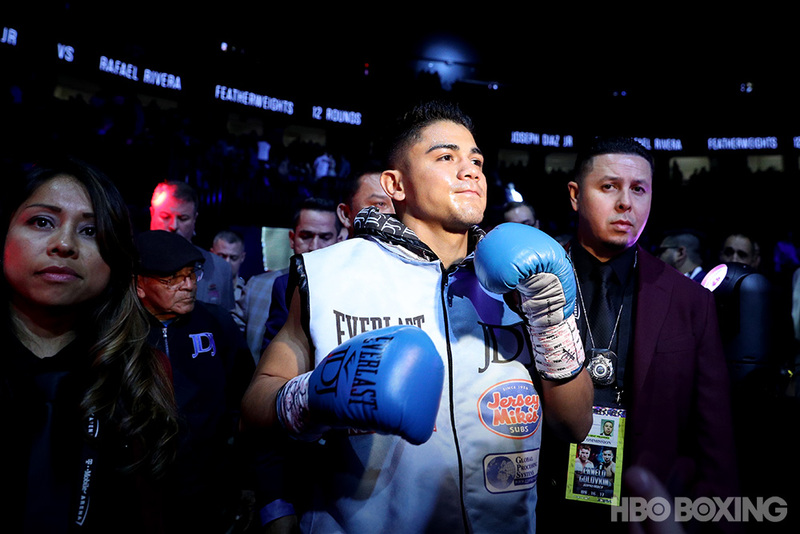 It only got worse for Caballero when his left eye began swelling in the fourth, and a head clash (unnoticed by referee Robert Byrd) hurt the Coachella, California native in the fifth. 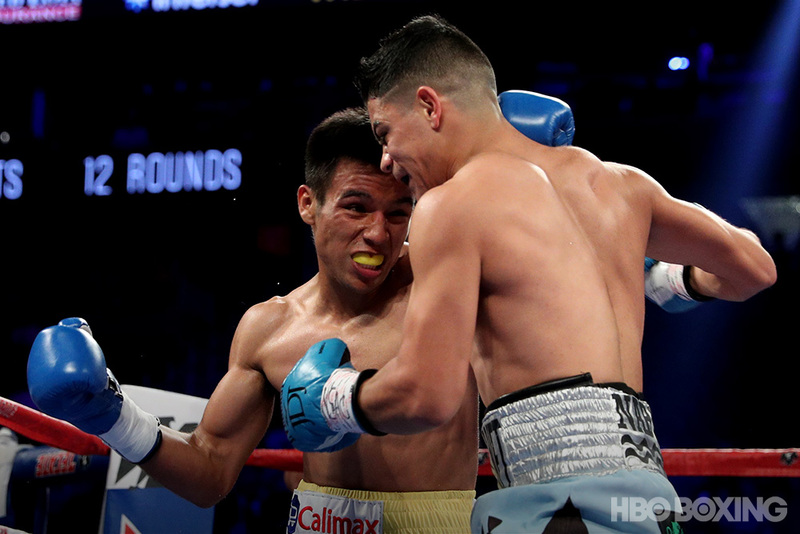 Round after round, Caballero was game but unable to get much done, even when the fight moved inside and got chippier in the middle-to-late rounds. There wasn’t much he could do; he was up against a De La Hoya, and, as it turned out, not in name only. In the opening bout on the pay-per-view telecast, lightweight Ryan “Blue Chip” Martin did not live up to his nickname but did escape with his perfect record intact, winning a highly questionable decision over Francisco “Paquito” Rojo. Highly touted Tennessee prospect Martin brought to the fight advantages in youth, length, athleticism, and abdominal definition, but it was Rojo who had the craft. The Mexican banged the body throughout, walked Martin down, and frequently beat the 24-year-old prospect to the punch, and when referee Russell Mora took a point from Martin in Round 9 for his third low blow, it seemed from this ringsider’s vantage point that Martin was going to need a final-round knockout to pull out the win. As it turned out, though, he just needed to a 10-9 round in his favor, and he got it on two of the three cards. Judge Ricardo Ocasio had Rojo winning by a decisive 98-91 margin, but Lisa Giampa and Max DeLuca went the other way, by scores of 96-3 and 95-94, respectively. 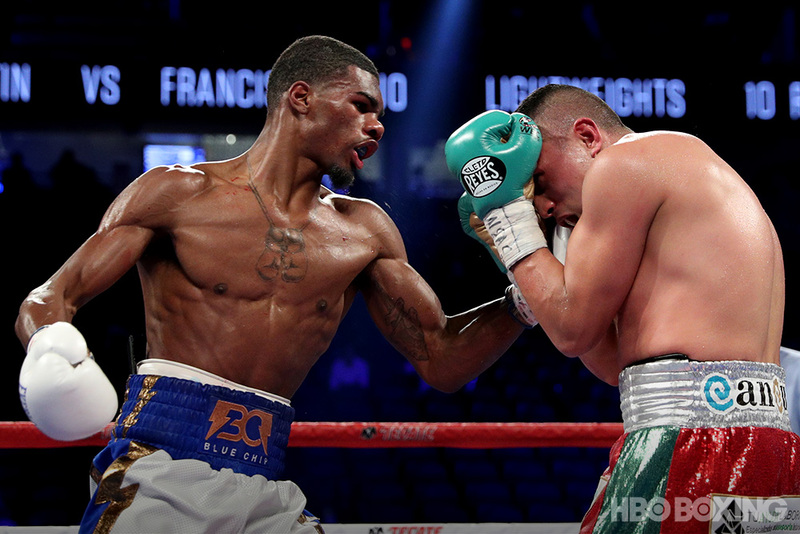 The crowd booed, but it’s the judges’ opinions that matters officially, and they saw fit to drop Rojo’s record to 19-3 with 12 KOs while Martin moved to 20-0 with 11 KOs. No matter how you scored it, it’s clear there’s work to be done if Martin wants to be regarded as truly blue chip.